The nightmare start to Big East Conference play for St. John's continued Wednesday night with an 88-82 loss to #11-ranked Xavier on the road. overall record is one game above .500, at 10-9. Xavier led 42-34 at halftime, and maintained that lead to start to second half, with a J.P. Macura three-pointer making it 57-51 at the 14:30 mark. 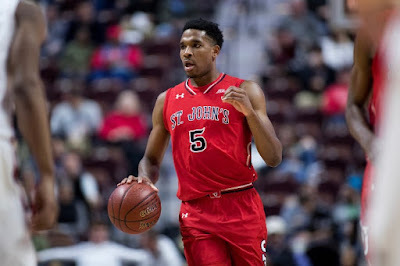 St. John's responded with a 10-2 run, with Marvin Clark II and Justin Simon getting a couple baskets each, and capped by a Shamorie Ponds jumper at the 11:50 mark to give them a 61-59 lead. A Tariq Owens layup made it 67-64 St. John's with 9:24 left, and that was the last point St. John's would score for the next seven minutes and 20 seconds. Over that span, Xavier went on a 15-0 run and the streak was snapped when Ponds his a three with 2:04 left that made it 79-70 Xavier. St. John's never got closer than six points, a Simon three with 11 seconds left that made it 88-82, which was the final. Xavier, who improved to 5-2 in the Big East and 17-3 overall, was led by Trevon Bluiett, who had 23 points on 8-15 from the field and 5-11 from behind the arc, with six rebounds and three assists. Kerem Kanter, the brother of the Knicks center Enes Kanter, had 22 points on a superb 8-10 from the field, including a three, with 13 rebounds, a block and an assist. St. John's was led by Justin Simon, who had 28 points on 12-16 from the field and 2-2 on threes, and narrowly missed having a double-double as he snared nine rebounds, along with six assists. Shamorie Ponds took a step back from his big game Saturday night against Villanova when he poured in 37 points. On Wednesday night at Xavier, he had 18 points on a tough shooting night of 6-20 from the field and 2-6 on threes, with four assists, a rebound, and a steal. Marvin Clark II had 15 points on 6-10 shooting and 3-6 from behind the arc, with two assists and one rebound. St. John's had one of their best shooting nights as a team, as they shot an even 50 percent (32-64) from the field, and 45.8 percent from three, or 11-24.